Located 70 miles southwest of Jacksonville in Orange Heights is Brown’s Farm. The family-owned business traces its roots back to John Henry Brown, who started the farm as a pecan grove in 1916. During the Great Depression, his son, Ralph, carried on the farming tradition by selling cabbage for a penny apiece. These days, the farm is known for producing some of the finest strawberries in the state, among other fruits and vegetables. Brown’s popular roadside stand branched out from a successful 4-H project launched by brothers Reggie and Roy Brown. Brown’s Farm pioneered direct farm marketing at their produce stand and has expanded ever since. Today, Reggie and Roy manage the family farm and take pride in their product. Reggie Brown: “We’re the Brown family, and the family has been farming on this property in this vicinity for close to 100 years. Someone often asked what makes the perfect strawberry. And on the Brown’s Farm, there is only one definition of a perfect strawberry. My father for decades has tasted every variety we have tested and grown on this property. And until that berry meets his test of being sweet, soft, red and delicious, we don’t grow it. My dad’s passion for producing great strawberries is the same passion that I’ve seen professionally with dozens and dozens of Florida farmers. Roy Brown: “My favorite part of growing the vegetable crops is when you see them coming up out of the fallow ground and you planted the seed out there. And it starts to come up, and you start to see that green line down that row. That gets you focused on continuing to go to the end of the crop. Reggie Brown: “The phenomenal experience of seeing a crop from start to finish is unbelievable. 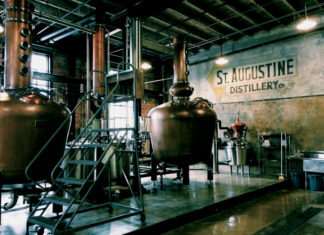 Florida distilleries craft a truly local product.